The OMWT-REC232 is a 418 MHz radio receiver designed to receive and decode packet data from all OMWT Series wireless transmitters. The OMWT-REC232 decodes the CRC-16 encoded packets and translates them to ASCII strings that are sent out the RS-232 serial port to the PC at 19200 Baud. No hardware handshaking or command protocol is required; all data packets are decoded and transmitted serially as they are received. 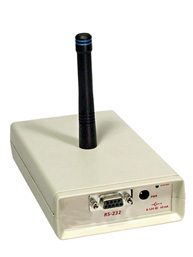 The OMWT-REC232 is very low power; most RS-232 ports provide enough power to operate the receiver. External power input is provided for host serial ports that cannot provide the necessary current. A simple design approach results in a low cost receiver that provides error checked ASCII data for all OMWT series wireless transmitters. The OMWT-REC232 is supported by the OMWT-SOFT Windows software. This makes connecting all OMWT Series wireless transmitters to your PC easy. OWMT-SOFT is actually a DDE client application that works in concert with the included DDE server application called OWMT-SOFT-DDE. OWMT-SOFT-DDE handles the details of communicating or receiving data from the wireless sensors. OWMT-SOFT-DDE verifies that the communication is correct, processes the sensor samples and then forwards the data to the DDE client. The OWMT-SOFT Windows software is responsible for the presentation and analysis of the collected data. The OMWT-SOFT Windows software can receive data from up to 100 of the OMWT Series wireless sensors, however it can only display data from up to six sensors at a time. If more than six sensors need to be displayed at any given time then the included OPC or DDE server software can be used to transfer data to other third party SCADA software packages. 참고: Each unit comes with complete operator’s manual. OMWT-REC232 wireless receiver is supplied with 1.8 m (6') RS-232 cable with DB9F connection to PC and 110 Vac adaptor.